Now that Spotify has caught up to Pandora on perception, will it stick after IPO? 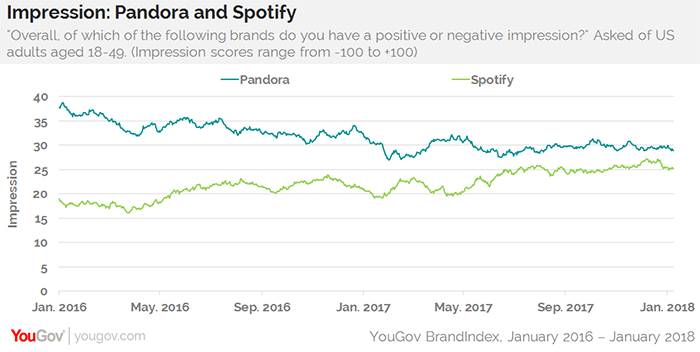 With an IPO on the horizon, Spotify may have a leading 35% market share in the streaming music sector, but rival Pandora dominated in key consumer perception metrics for a long time. However, since the middle of last year, Spotify significantly closed those gaps with the core 18-to-49 adult demographic, according to YouGov BrandIndex. Pandora launched a premium service in March 2017 that combined its normal radio-type features with a Spotify-like ability to search and play any song, as well as create playlists. Even though the $9.99 price point matched comparative streaming services, it didn’t appear to boost the brand on any of YouGov BrandIndex metrics. In the case of value perception, it actually seemed to bring it down to its lowest levels in at least three years. Spotify received a bump across all metrics when it upgraded its family plan in March 2016, putting it at a matching price point with Apple Music and Google Play. The most obvious examples of the closing gap between the two services with the 18-to-49 demo are on YouGov BrandIndex’s Impression and Quality metrics, both of which have score ranges from -100 to 100, with a zero-score equaling a neutral position. The Impression gap closed 19 points over the past two years; the streaming services are now four points apart. Quality score closed 17 points over the same time frame to put them even in late December, but the gap is now two points. 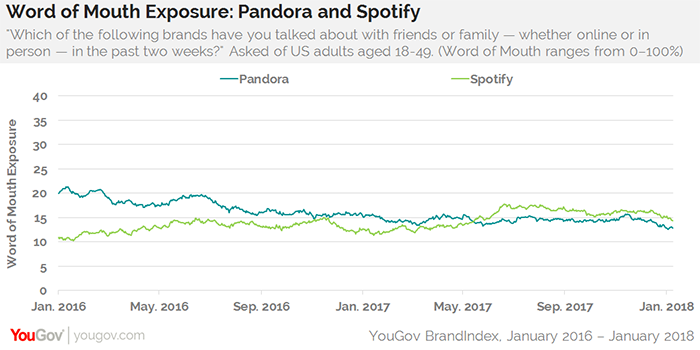 Spotify actually passed Pandora in the Word of Mouth metric in the middle of last May, though it has struggled to break out since then. On June 25, 18% of adults aged 18 to 49 had talked about Spotify with family and friends in the past two weeks, soon dropping to 15%. That’s just two percentage points ahead of where Pandora is now, at 13%. Pandora had been on a long Word of Mouth decline since early 2016, when it was at 21%. The battle in value perception between the two services has gone back and forth. 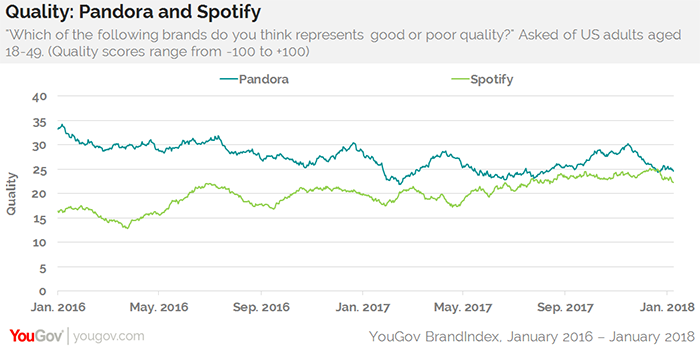 While Pandora’s Value score weakened after introducing its premium service last March, Spotify’s Value score marched straight up, passing Pandora in April and peaking on September 25. Since then, it’s slid back down to a virtual tie with Pandora. According to YouGov Profiles, adults aged 18 to 49 who have a positive impression of each service tend to skew more female, especially Pandora. They also are more likely to be Southerners who lean Democratic rather than Republican.